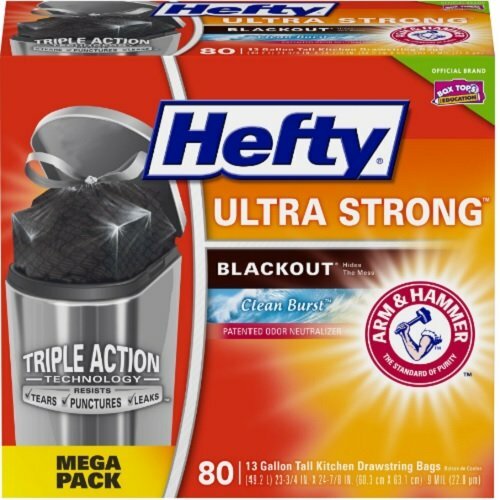 Trust Hefty Ultra Strong Blackout Tall Kitchen Bags to keep your kitchen waste contained and out of sight. Thanks to Triple Action Technology, these tough trash can liners resist leaks and tears, providing the highest puncture protection available in a flexible garbage bag. That stretchy strength means you don't have to worry about unexpected bag breakage and inconvenient messes. The blackout kitchen trash bags hide unsightly messes, keeping your garbage in the dark. A break-resistant grip drawstring makes it easy to close the trash bag and cart it away without incident. As an added bonus, these tall kitchen garbage bags include a patented Arm & Hammer odor neutralizer to keep unpleasant smells at bay. A Clean Burst scent adds freshness. While these black garbage bags are just the right size for your kitchen trash can, don't be afraid to use them for tougher jobs, such as garage, basement and construction cleanups. These scented trash bags provide the strength and odor control you need to handle the heaviest and most odoriferous jobs. Every package of Hefty trash bags includes one clippable Box Tops for Education label to help you earn cash for your school. All Hefty trash bags are backed by a 100% satisfaction guarantee. Hefty Strong Lawn & Leaf heavy duty trash bags make tackling tedious home and garden cleanup jobs a breeze. These extra-large, extra-strong yard waste bags are perfect for collecting leaves, twigs, sticks and grass clippings. 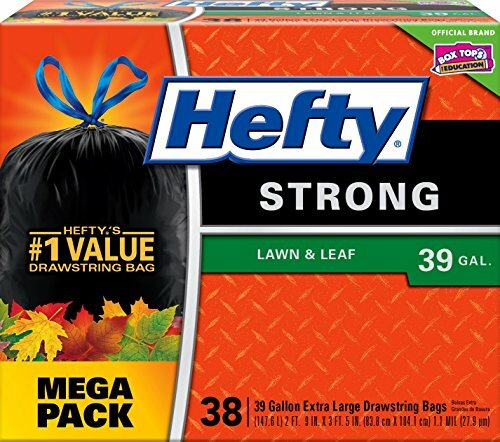 As Hefty's #1 value drawstring bag, the 39 gallon trash bags are designed to hold large quantities of yard waste to help make quick work of your dreaded outdoor chores. Signature Hefty quality and extra-thick 1.1-mil plastic ensure these lawn bags deliver superior puncture resistance, and a dependable drawstring closure makes securing and transporting the leaf bags easy. Rely on these strong, extra large trash bags to help you finish your yard chores quickly and efficiently so that you can move on to your next activity. 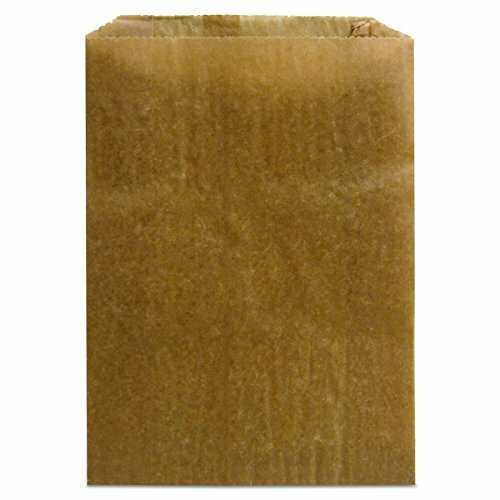 You can depend on these lawn and leaf bags to perform up to snuff. Plus, when you purchase these Hefty garbage bags and clip the included Box Tops for Education coupon, you help support your local school's efforts to earn cash for supplies and equipment. All Hefty trash bags are backed by a 100% satisfaction guarantee. 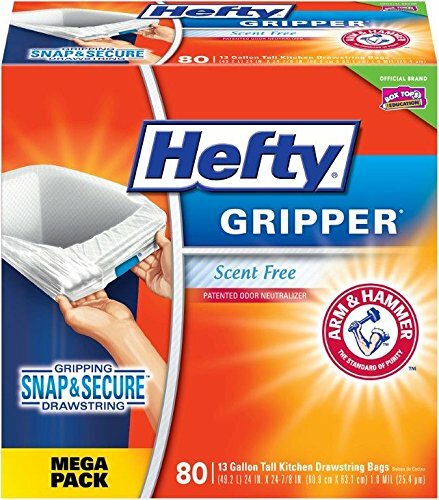 Hefty Gripper Tall Kitchen Bags let you dispose of kitchen trash neatly and efficiently. The trademark Snap & Secure drawstring tightly grips your garbage can, preventing these Hefty kitchen trash bags from slipping into the can. In addition, Hefty Triple Action Technology allows each garbage bag to stretch while resisting tears, punctures and leaks, and a patented Arm & Hammer odor neutralizer fights nasty odors, keeping your kitchen fresh. Designed to fit most kitchen trash cans, these 13 gallon kitchen trash bags have a drawstring closure to keep contents contained inside while offering a convenient grip when the time comes to take out the trash. Fill these trash can liners to the top without worrying about breakage. Each package includes one Box Top to help you earn cash for your school. All Hefty trash bags are backed by a 100% satisfaction guarantee. The bags with Graduated markings to measure oz and cc/mL Single use Latex-free, capacity holds more than 1500 cc/ml. Classic Blue Vomit / Barf Bags for Travel Motion Sickness Digestion & Nausea. Portable, Easy to use, Discrete & Disposable. Perfect For Car Motion Sickness Kids, Pregnant Women, Drunk Uber & Lyft Passengers. SECURE AND SEALED: With its closure system - twist, and secure bag into a notched ring that helps to seal and eliminate odors and reduce contamination. Convenient quantity for users with lower requirements. The ideal bag for home office use.Includes 130 can liners. 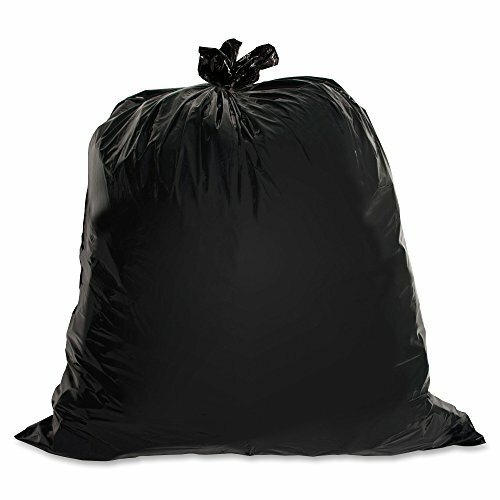 Commonly used for lawn and yard trimmings and for rollaway cans, these black trash bags can hold trash with ease. 1.5 mil thickness is a heavy gauge plastic and ensures maximum puncture resistance. 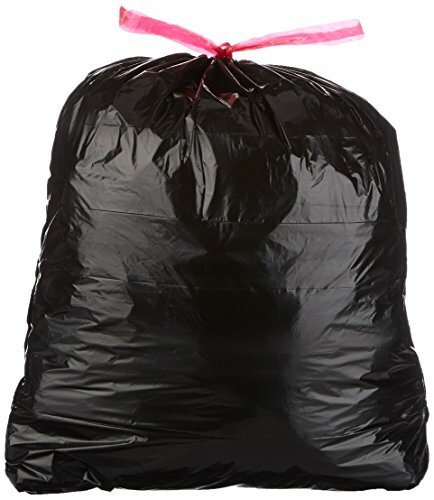 Buy 65 gallon trash bags in bulk and save even more! Purchase with confidence, your satisfaction is guaranteed. Made with superior resins in the USA. HEAVY DUTY - 1.5 MIL THICK - Strong enough to tolerate all residential household garbage and commercial waste. Made from industrial-strength low-density resins (thicker material). 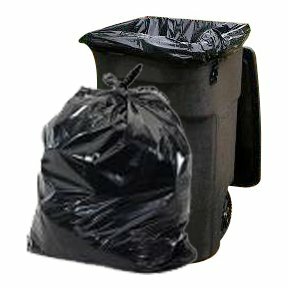 LARGE SIZE - 65 Gallon black garbage can liners, 50W x 48H. Fits outdoor rollaway garbage cans and drum cans. Bottom is a gusset seal. Bags come folded (50 Count). 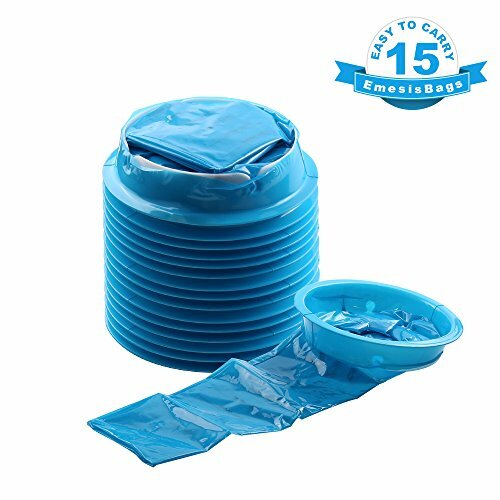 NO TEARS or LEAKS - Trash bag liner is durable and designed to hold the toughest garbage with absolutely no tears or leaks. Proudly made in the USA. SECURE TRASH BAG - Firmly secure trash bag in place with a rubber band (sold separately). Bag can then be reused for many garbage pickups. Alternatively, before pickup simply remove band and tie bag closed. KEEPS TRASH CAN 100% CLEAN - Garbage bag liners ensures can will remain totally clean inside. No more smell or dirt around your trash cans! Maintain your can in perfect brand new condition! Extra-strong, heavy-duty trash bags are made with puncture-resistant resins and are three times more puncture-resistant than standard liners. 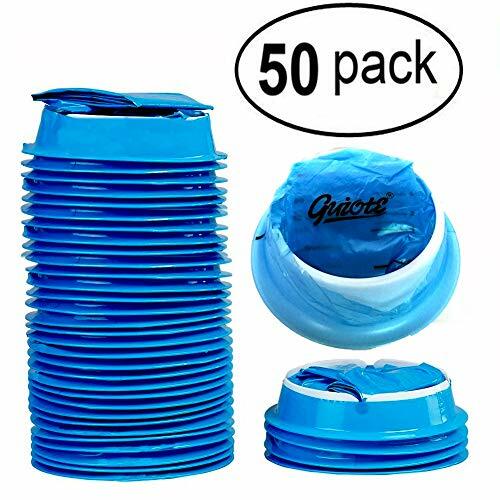 They are ideal for extra-heavy trash applications, such as heavy food, office waste, boxes, cans and construction debris because they are puncture-resistant to sharp objects. Star-bottom seal is designed for a more even distribution of contents. Two-ply, low-density bags come in a convenient coreless roll for easy dispensing anywhere. The 1.5 mil thick bag holds 55 to 60 gallons. The bag size is 39" x 56". Black plastic resin conceals contents so, even if your janitorial crew collects garbage during regular work hours, you and your guests will not have to look at unsightly garbage. If you have ever cleaned vomit from your car upholstery, then you know that the horrible smell never goes away. ATDAWN emesis bag will keep your shirts, pants, and car seats clean and free from barf. No more messy clothes or paying for expensive cleaning services for your car's interior! Easy to wrap and dispose after use. capacity holds more than 1000 cc/ml. PORTABLE AND HANDY: Small, light, and compact, can be easily tucked anywhere for easy access when urgently needed. Features a wide opening to prevent spills when in use. Easily seal afterwards to eliminate leaks during disposal.It is also very easy to wrap up and dispose after vomiting. SECURE AND SEALED: these premium quality, hospital grade, emesis bags are constructed from strong, ultra-durable materials allowing them to take some abuse while keeping your waste from spilling out. With its closure system - twist, and secure bag into a notched ring that helps to seal and eliminate odors and reduce contamination. VERSATILE USE - Not just for traveling purposes, these disposable emesis bags are great for home or discrete enough for office use. Ideal for pregnant who are prone to morning sickness, and deal for people with medical or health conditions who need to keep a vomit bag handy. A must have for taxis and car service providers. COST-EFFECTIVE: The efficiency of this product is worth the price. This 50-pack puke bag will prevent vomit fluids from spilling all over your clothes, car seat, carpet. No more messy clothes or paying for expensive cleaning services for your car's interior! Easy to wrap and dispose after use. This package vomit bag has Qty of 50, with Graduated markings to measure oz and cc/mL, Single use Latex-free, capacity holds more than 1000 cc/ml. Manage trash in your nursery, office, bathroom, car, and more using small garbage bags from Hefty - the only small bags with odor control. All Hefty small bags are perfectly sized for small trash cans, and the scented varieties feature Arm & Hammer odor neutralizing agents that control odors inside the bag and keep smells from getting into your home. Convenient flap ties help keep trash in the can and off the floor when removing and closing the bag. Every package includes one Box Top to help you earn cash for your school. 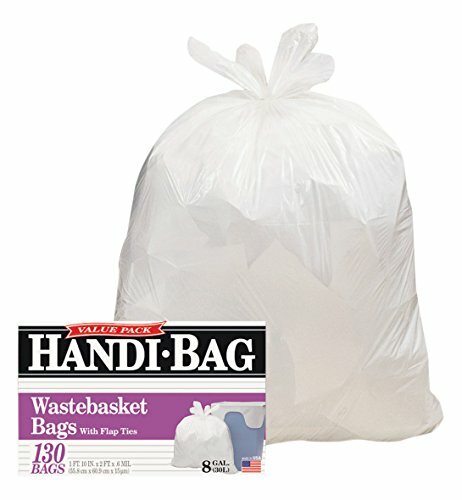 Package contains 26 white, 4-gallon small trash bags with Clean Burst scent. Manage trash in your nursery, office, bathroom, car, and more using small garbage bags from Hefty - the only small bags with odor control. All Hefty small bags are perfectly sized for small trash cans, and the scented varieties feature Arm & Hammer odor neutralizing agents that control odors inside the bag and keep smells from getting into your home. Convenient flap ties help keep trash in the can and off the floor when removing and closing the bag. Package contains 26 white, 4-gallon small trash bags with Clean Burst scent. Thorough cleaner disinfectant is a powerful bleach product with efficacy against 36 microorganisms and a one-minute kill time for a broad range of bacteria, viruses and fungi. Kills Norovirus, MRSA, TB and VRE, with a two-minute kill time for C. difficile spores. 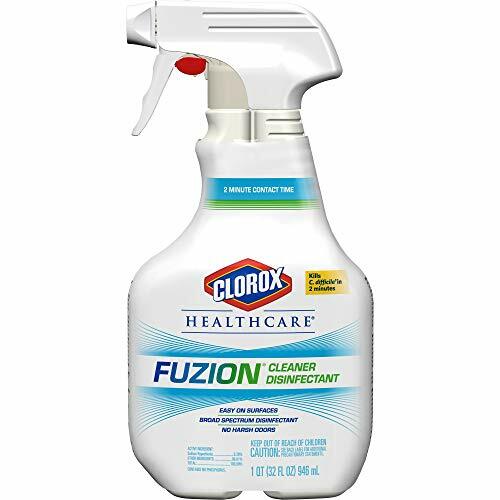 The formula contains sodium hypochlorite and a neutralizer, which combine to form hypochlorous acid, a pH-neutral form of bleach. The neutralizer breaks down the bleach once the 2-minute contact time is reached, enabling broad surface compatibility, little to no residue, and no lingering bleach odor. Ergonomic bottle shape and advanced trigger technology makes the product easy to use throughout the facility. Application: Disinfectant/Cleaner Applicable Material: Ceramic Enamel Fiberglass Finished/Sealed Wood Laminates Metal Plastic Sealed/Engineered Stone Vinyl Chemical Compound: Sodium Hypochlorite 0.39% 99.61% Yields 0.37% available chlorine Dirt Types: Bacteria Dust Germs Grease Grime Oil-Based Soil Organic Matter Smoke Film Soap Scum Water-Based Soil. The Ultimate Set Of Leakproof Emesis Bags Is Finally Here -No More Messy Accidents! Looking for a set of well-made, reliable and convenient vomit bags for your long road trips? Need a practical and ergonomically designed emesis bag for your pregnant wife? Want to protect your precious car interior from drunk passengers? 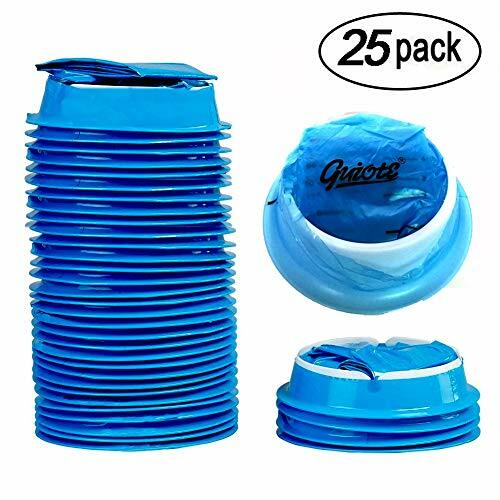 Introducing The HealQu Disposable Blue Car Vomiting Bags 48-Pack! Protect Your Carpets, Furniture & Clothes! 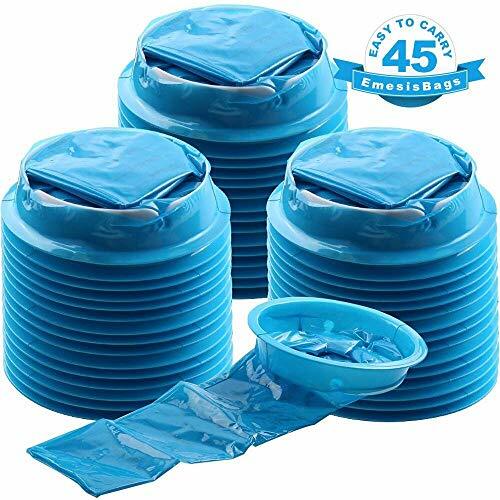 Our handy, sturdy and reliable emesis vomiting blue bags will not only keep your couch, armchair, carpets or t-shirts safe from vomit, but you will also be able to effectively and easily deal with barf, since all you have to do is twist the bag and dispose of it! And the best part? It's the perfect way to effectively deal with the nasty symptoms of air sickness, car sickness, sea sickness, motion sickness or morning sickness! Discover The Uber-Driver Approved Emesis Bags! 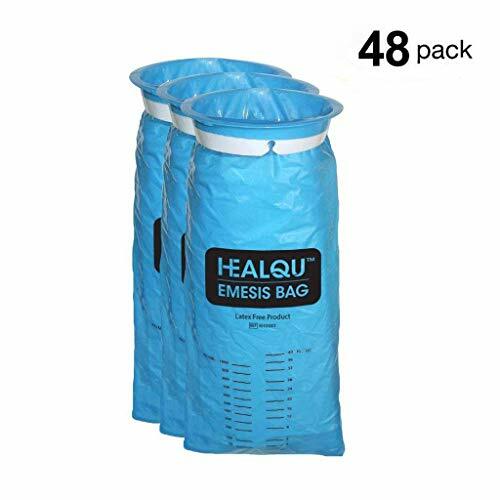 If you are a Taxi, Uber, Lyft or designated driver and want to make sure that your drunk passengers and friends do not ruin your car interior, then our disposable blue emesis bags are exactly what you need! Why spend a small fortune on car wash services? Instead of wasting time, effort and money on cleaning your car backseats, you can always have a few HealQu vomit bags in your car and solve this problem once and for all! Click "Add To Bag" Now & Make Your Life Easier! SAVE YOUR EFFORT, MONEY & PRECIOUS CAR INTERIOR from barfing accidents with the HealQu emesis bags, which are specifically designed to help you avoid spending a small fortune on cleaning your car upholstery. The leak-proof and puncture-proof design will keep everything sealed inside and away from your seats! STRUGGLING WITH MOTION SICKNESS OR SEA SICKNESS? Don't leave home without your lightweight and reliable vomit bags by HealQu! Our disposable blue sick bags will help you effectively deal with motion sickness, air sickness, car sickness or sea sickness and avoid messy and stinky accidents. IDEAL FOR PREGNANT WOMEN & SICK CHILDREN! If you are suffering from morning sickness and need a set of vomiting bags that will protect your loved ones from that awful smell, then our emesis vomit bags are exactly what you need. Plus, our air sick bags are perfect for sick kids or adults, since they are super-easy to use! A MUST-HAVE FOR EVERY UBER, LYFT, TAXI OR DESIGNATED DRIVER! If you have ever cleaned vomit from your car upholstery, then you know that the horrible smell never goes away. That's exactly why our vomit bags are a life-saver for professional drivers who want to keep drunk passengers from ruining their upholstery. GET YOUR HEALQU VOMITING BAGS 48-PACK NOW 100% RISK-FREE! When it comes to keeping your home, car, ship cabin or airplane cabin 100% puke-free, we don't like to take any risks and neither do you. That's why our disposable emesis bags are backed by our IRON-CLAD money back guarantee if you are not satisfied within 30 days! What are you waiting for? The bags with Graduated markings to measure oz and cc/mL Single use Latex-free, capacity holds more than 1000 cc/ml. Classic Vomit / Barf Bags for Travel Motion Sickness Digestion & Nausea. Convenient, Portable, Discrete & Disposable. These giant 65 gallon Clear garbage bags are ideal for busy offices, kitchens, retail stores, & large-scale cleanups where you need a big, strong, attractive trash bag. At 1.5 mil thick, They have great puncture resistance, so they ll even hold out under heavy use outdoors or in a warehouse. Clear trash bags let you see exactly what s inside at a glance, so they re also great for storage or donations, & to prevent accidental disposals. Proudly made in the USA to the most exacting quality standards, these low-density bags are sealed with a reinforced gusset seam to keep leaks at Bay. Large size - 65 gallon Clear garbage can liners, 50W x 48h. Fits outdoor rollaway garbage cans and drum cans. Bottom is a gusset seal. Bags come folded (50Count).